This shoe grows as a child does, which is a big deal for countries where many of the kids go without. While volunteering in a Kenyan orphanage, Kenton Lee saw a constant need for shoes—something we take for granted but that protect from disease, sharp objects and more in underserved areas. He founded Because International and invented a shoe with no mechanical parts, a compressed rubber sole, a high-quality leather body, and heavy-duty snaps to hold it all together. The Shoe That Grows is easy to clean and, best of all, it lasts five years. The simple but life-changing design can benefit children who either don’t have shoes or, when they grow, can’t afford new ones. By partnering with the organizations and individuals that already serve the most deprived areas, Because International gets its shoes to the kids who need them most. It’s an efficient model that lets them focus on making great shoes. At only about $15 a pair, this nonprofit is keeping kids around the globe safe on their feet. Hello! My name is Kenton Lee, and I am the founder of Because International and the creator of our first project The Shoe That Grows. I love helping put people—especially kids!—in a better position to succeed. We try to do this through innovation—creating products that are small things that make a BIG difference to kids living in extreme poverty. The Shoe That Grows adjusts five sizes and lasts five years. It is a great example of our commitment to innovative products that make a big impact on the lives of kids. We are thrilled to share our story with our friends at Grommet today! Can you tell us a little bit about the company behind the Shoe that Grows? Because International is the 501(c)3 nonprofit organization that essentially serves as the parent company for The Shoe That Grows. Because International has a mission to help put kids, families, and entrepreneurs in the best place to succeed. We do that by creating innovative products that help the daily life of kids. And we use the production of those products to brings jobs and increased economy to areas that are struggling. Finally, we are beginning to work with local entrepreneurs to help them turn their ideas into amazing products and then turn those products into businesses. Because International has five full-time team members working out of our main office in Nampa, Idaho. What elements of Because International's work did you consider essential from the beginning? What about your first product, what did you consider essential in creating the Shoe that Grows? There are certain values that are extremely important to us at Because International. The first is innovation. We believe in innovation for those who can't afford it. It makes sense for big for-profit companies to innovate new products because they have customers willing to pay for it. But we saw a gap in innovating and improving products for those who cannot afford it. Innovation is the most essential part of our organization. But we also place a big emphasis on partnership and not "re-creating the wheel". For example, we don't distribute any of our shoes ourselves. But we rely on partnering with groups and organizations who work with kids to get our shoes to the kids who need them most. Finally, we have a high value on listening. We recognize that the best ideas and solutions come from those who are living right where things are happening. As we work on new projects - it all starts with listening to the thoughts and ideas of those living in extreme poverty. They have amazing ideas for innovative products. We love listening to those that we seek to help. It is easy to take something as simple as a pair of shoes for granted. Because International's Shoe that Grows is a great reminder of how important they can be for health and quality of life. Why was it important for you to develop this product? I used to not know how important shoes were for kids. But then I lived in Kenya and saw firsthand the BIG difference that shoes make for kids challenged by extreme poverty. But the real key for me was when I got to know the kids at the orphanage where I lived and worked. They became my friends. I cared a lot about them. And I saw the harm that happened to their feet and overall health when they didn't have shoes or had shoes that they outgrew. So it was important for me to develop this product because I wanted to create something that would help my friends have a better daily life. Just $15 for a shoe that expands 5 sizes and lasts 5 years is almost unbelievable. What reactions have you gotten from people that learn about the Shoe that Grows for the first time? What about the communities you work with? How have they reacted? Almost everyone who sees The Shoe That Grows for the first time is really impressed and excited. They usually get excited about three things: how the shoes grow, how strong and sturdy the shoes are, and the price point. But my favorite reactions are from the adults - parents, teachers, pastors, leaders - in the community where the shoes are being distributed. The kids are obviously excited to receive a great pair of shoes. But I love seeing the way the parents react to the shoes. They are thrilled with the durability, the sturdiness, the quality of the shoes. Their excitement for The Shoe That Grows is something I will always hold with me. How is Because International’s approach different from similar organizations? How do you define success and what is your team’s "secret sauce” to success? The "secret sauce" to our success comes in our dedication to Practical Compassion. For us, this means that we do the small things that make a BIG difference. Our shoes are a great example of that. They are small things that make a BIG difference for kids. We know that it isn't the ultimate solution. We know that it doesn't solve the root issue of a lack of adequate sanitation or clean water, etc. But we believe that our shoes are daily items that make a BIG difference in the normal, everyday life of kids. And that's important. We like operating in that space. All of our innovative products will be focused on really practical compassion - just small things that make a BIG difference. That's what makes us unique. We aren't trying to change the world. We just want to make a difference. What were some unexpected challenges and rewards in trying to redefine a product that has been the same for so long? It is challenging to explain this totally new shoe to people. It makes a ton of sense when people can see it, feel it, move it around physically as they hold a pair. But it has been tough to show how it works online. And then it has also been challenging to find ways to prove the durability. We have done third-party independent testing, use great materials, have a functional design, and have had kids wearing them for more than two years. The rewards are seeing how people are attracted to our shoes. Many people see it and are immediately drawn to the simple innovation of it. Often these people join our cause through donations and helping distribute our shoes. We love that. It is just a cool product that really connects with people. This shoe grows as a child does, which is a big deal for countries where many of the kids go without. 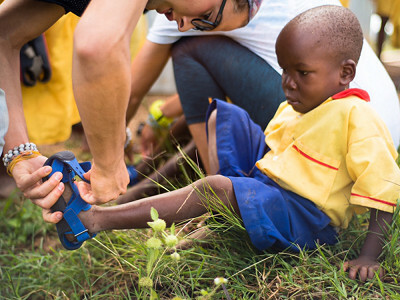 While volunteering in a Kenyan orphanage, Kenton Lee saw a constant need for shoes—something we take for granted but that protect from disease, sharp objects and more in underserved areas. He founded Because International and invented a shoe with no mechanical parts, a compressed rubber sole, a high-quality leather body, and heavy-duty snaps to hold it all together. The Shoe That Grows is easy to clean and, best of all, it lasts five years. The simple but life-changing design can benefit children who either don’t have shoes or, when they grow, can’t afford new ones. By partnering with the organizations and individuals that already serve the most deprived areas, Because International gets its shoes to the kids who need them most. It’s an efficient model that lets them focus on making great shoes.